Interest in Swansea and Nantgarw pottery and porcelain, as well as values have been increasing over the past few years with many comparing the prestige pieces of the short lived potteries to the best of any other pottery in the UK. The foremost collection of Welsh, Swansea and Nantgarw pottery was the Sir Leslie Joseph Collection which sold for in excess of £1.1 million at Sothebys in 1992. There were 900 lots in the auction and some of the items return to auction occasionally. Prices have come down from these 1992 highs but compared to other pottery and porcelain, the rarity and quality of the Swansea porcelain has seen the market fair well. We take a brief look at the history and show a price guide of some realised prices. A Swansea Teacup and Saucer, C1814-17 painted by William Billingsley with vignettes, saucer 13.5cm diam, painted Swansea in red script. Sold for £550 at Mellors & Kirk, June 2017. 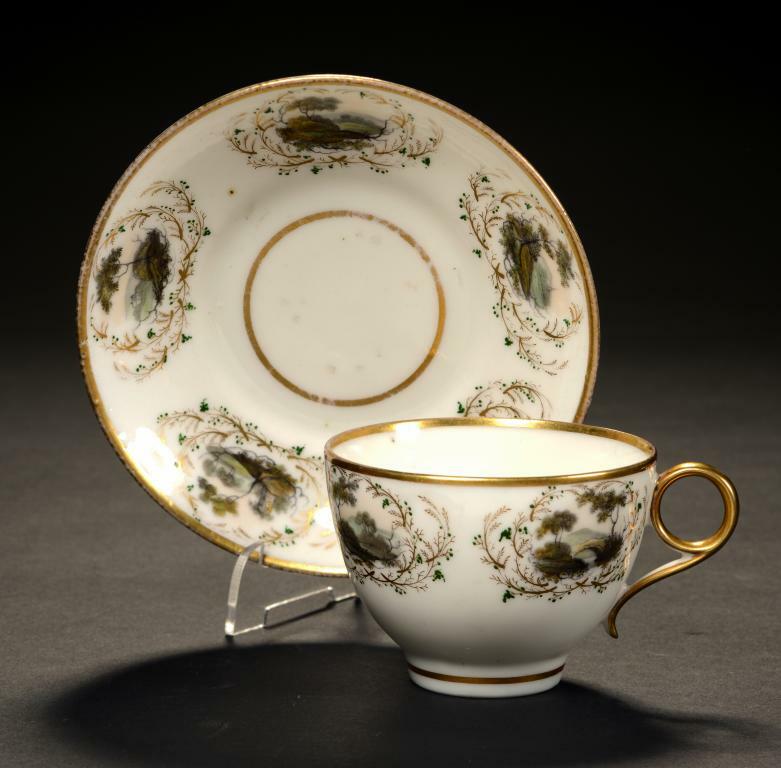 There are two distinct periods in the history of Swansea pottery and it is the period from 1813 associated with William Billingsley (1758–1828) and the fine highly translucent soft paste porcelain that is most collected and desirable. The production of pottery in the area can be traced back to the early 17th century with a number of good quality clay resources, but it was not until 1764 when William Coles, an iron-founder, established a pottery on the banks of the river Tawe that the production of items other than utilitarian pieces began. Initially producing tokens and coarse redware for farm and domestic use and shortly after creamware and lead-glazed earthenware were added. William Coles died in 1778 and the factory was inherited by his three sons with John Haynes taking over the running of the business. They were joined by George Haynes in around 1787 who brought with him new business strategies based on the ideas of Josiah Wedgwood and his Etruria works. 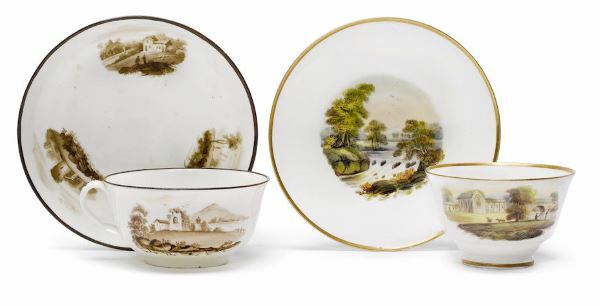 The buildings were extended, George Haynes renamed the pottery the Cambrian Pottery, and importantly attempts to produce a more refined white porcelain and which, by 1796, was regarded as sufficiently similar to “genuine” porcelain as to make no discernible difference. 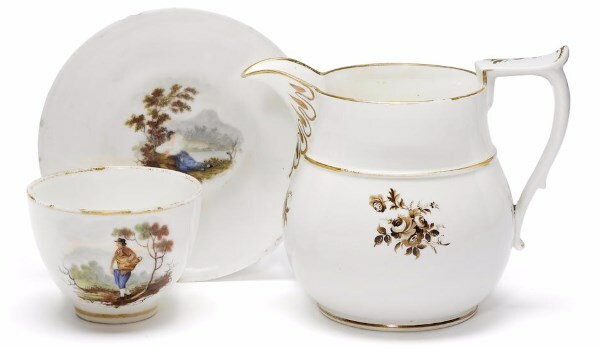 A rare Swansea jug and a teacup and saucer circa 1815-17. The jug of squat bellied form, painted in brown with scattered flowers, the spout and handle gilded, 12.7cm high, script mark in brown (slight wear), the teacup and saucer in ‘glassy paste’, painted by William Billingsley with rustic figures, saucer 13.8cm diam (saucer chipped, wear to gilding). Sold for £687 inc. premium at Bonhams, May 2016. In 1804 Haynes had devolved controlling ownership of The Cambrian Pottery to William Dillwyn, who was to then transfer the titles in 1810 for the entire factory to his son MP and botanist Lewis Weston Dillwyn. The production of opaque china evolved apace at the Cambrian works, and the family engaged artists including the excellent William Weston Young, who was renowned for his ability to reproduce natural history subjects which he would pain from life, being “remarkably truthful and free in his declinations”. Lewis Weston Dillwyn had previously used Young to illustrate his books on flora and fauna. 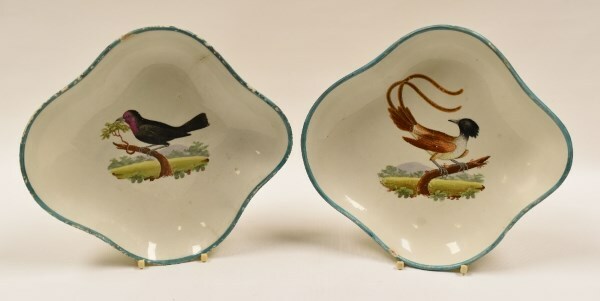 Swansea Pottery – pair of shaped shallow dishes with green border, both having interiors painted with a single perched study of a bird in a landscape by William Weston Young, bases inscribed with titles as ‘Long Tailed Pye’ and ‘Red Breasted Ouzel’, both bearing early collection labels inscribed ‘Old Swansea – Bird Painted by WW Young’, 22cms long. Sold for £190 at Roger Jones & Co, Feb 2016. In 1813 William Billingsley purchased Nantgarw House on the Glamorganshire Canal, and with his son-in-law Samuel Walker set up a factory at Nantgarw. Although the Billingsley and Walker partnership achieved immediate rave reviews for the works they managed to produce, a number of problems had arisen and financially they found it increasingly difficult to pay their way, and looked to secure further funding which included an application to the Board of Trade, who duly arranged a visit to assess the viability of the business, to be carried out by none other than Lewis Dillwyn of the Cambrian Pottery. Dillwyn was aware of Billingsley’s work and knowledge and was very impressed – he not only approved funding he invited Billingsley to relocate his operation wholesale to newly constructed and entirely bespoke premises which were to be erected alongside the existing Cambrian Pottery works for his exclusive use. This move took place in 1814. 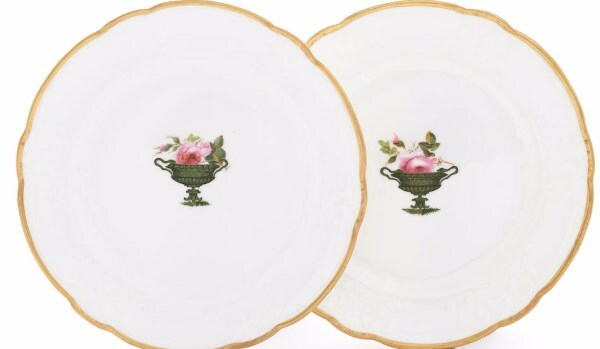 A Pair Of Swansea Porcelain Plates By William Pollard having moulded borders with scrolls, flowers and ribbons and with an interior spray of flowers and with a gilt scroll and diaper border, red stencil SWANSEA mark to base of one, 20.5cms diam. Sold for £1,700 at Roger Jones & Co, Sept 2016. Everything was in place for the zenith of Swansea Pottery from 1814 to 1820. So why was Williams Billingsley in Nantgarw and why was Dillwyn so impressed? Billinglsey had been an apprentice at Derby under William Duesbury and after twenty years he had established a reputation as ‘a man of great genius, of extraordinary talent, of extreme ability as an artist, and of skill as a practical potter‘. He left Derby in 1795 and formed the Pinxton Pottery with John Coke, and later to Mansfield and then to Torksey (where he met Samuel Walker who was to marry Bllingsley’s daughter Sarah) until arriving at Royal Worcester in 1808, working under the second generation Flight and Barr partnership (Barr, Flight & Barr 1804–1813), he was instrumental in the firm’s refinements of its porcelain recipe. Billinglsey and Walker had signed an agreement not to disclose their new porcelain recipe to a third party, but there was no clause preventing them from using that recipe themselves. With this new technical expertise added to his own repository of knowledge, Billingsley and Walker moved to the pottery at Nantgawr. Billingsley is described on the Museum of Royal Worcester web as an ‘infamous rogue and artistic genius‘. 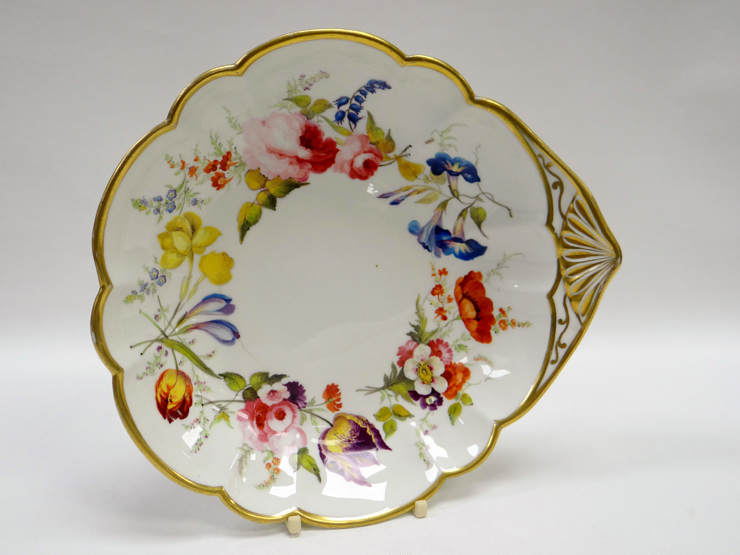 Swansea Porcelain Dish Possibly Probably Decorated by David Evans of shell form with gilding and painted with a continuous band of wild-flowers, red Swansea script mark to base, 21.5cms. Sold for £880 at Roger Jones & Co, Sept 2016. With the move to the Swansea Pottery in 1814 the factory started producing the fine works sought after today. However, the production process continued to inconsistent and costly and with Worcester questioning their agreement Billingsley, Dillwyn asked Billingsley and Walker in 1817 to leave and they returned to the pottery in Nantgawr. They managed to receive significant private funding and after producing a signature service was presented to the Prince of Wales, the reputation of the factory was greatly esteemed the highest social circles and was to ensure a regular flow of commissions for high-value work. The factory achieved considerable success producing works for the foremost London-based producers and Billingsley and Walker were then approached by John Rose of the Coalport works. Offered a lucrative package the pair accepted, and in April 1820 and consistent with his lifelong wanderings Billingsley moved to the Coalport Pottery Works at Ironbridge, Shropshire where he worked until his death in 1828. 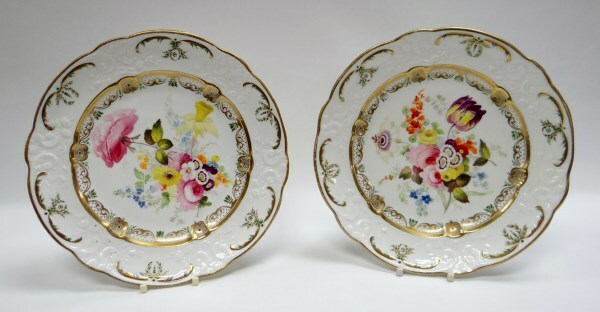 A pair of Nantgarw plates, circa 1818-20. The borders moulded with c-scrolls, painted with the ‘Prince Regent’ pattern of a central green and gold classical vase, supporting a pink rose sprig, 22cm diam, impressed NANT-GARW CW. The painting is sometimes attributed to William Billingsley. Sold for £812 inc. premium at Bonham, London, November 2015. The title deeds of the Nantgarw pottery, as well as the full inventory of effects and a large repository of unfinished pieces were passed to William Weston Young. Young tried to maintain the pottery but without Billingsley and Walker, his ambitions were always destined to founder, and after a brief but glorious spell where some of the existing blanks were exquisitely decorated by a Thomas Pardoe, the last significant sale of Nantgarw porcelain took place in October 1822. Pardoe’s son was to fire up the kilns on the banks of the Glamorgan Canal again almost a decade later, but now production was limited to brown-glazed Rockingham earthenware, stoneware and – ultimately – clay pipes in vast quantities. The Cambrian Pottery factory survived until 1870.